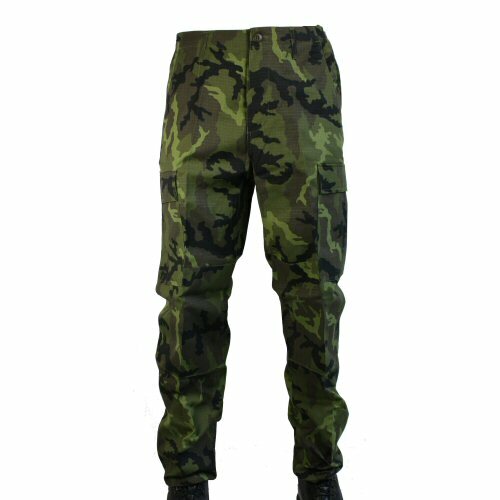 Classic ripstop ACU trousers with 8 pocket design and knee and seat reinforcements, available in Czech M95 woodland camo. The Czech M95 camo is a combination of the ERDL pattern with shades of green for effective concealment in jungle, woodland, coppice and grass. ACU trousers feature two hip pockets, two large cargo pockets with slanted flaps and expanding pleats, two seat pockets with button flaps and two lower leg pockets. Seat and knee are reinforced with a double layer of material, and the knees open to accept padding. Drawstring ankle hems help to speed blousing of the trouser legs and prevent insects or dust from entering from the trouser leg. Button waist and fly. 1 1/4 inch belt loops accept 1 1/4 in army belts. Lightweight and quick drying machine washable ripstop. Sizes are (inches) M (34), L (38), XL (42).